BIG BANG THEORY FRAUD: Where do we stand? WHAT’S IN A NOBEL NAME? Do you know what the dance of the Whirling Dervish means? He receives gifts from Heaven with his right hand (upturned), and gives them to the Earth with his left (downturned). And such is John Mather’s generosity. He received his ‘gift’ from Heaven (also known as Sverige), and each year he passes a little of it on to the Earth (also called Greenbelt). Between Mather and NASA and the Nobel Foundation, they got some kind of a sublime gig going on there – year after year after year. 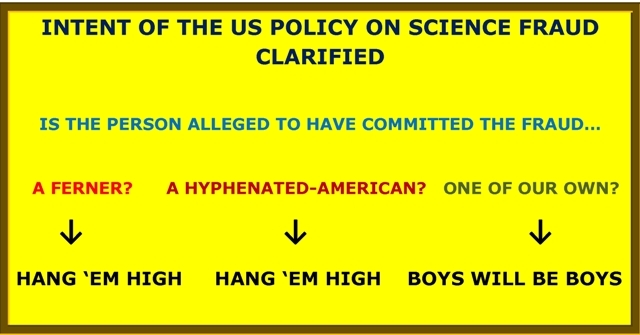 Given by science fraud John Mather from his fraudulent Nobel Prize money to summer interns at NASA Goddard Space Flight Center. This is the third year of these awards. If you were given a $10 million Bernie Madoff Enterprise Award, would you take it? I suppose it would depend on one’s need vis-a-vis one’s sense of self-worth. 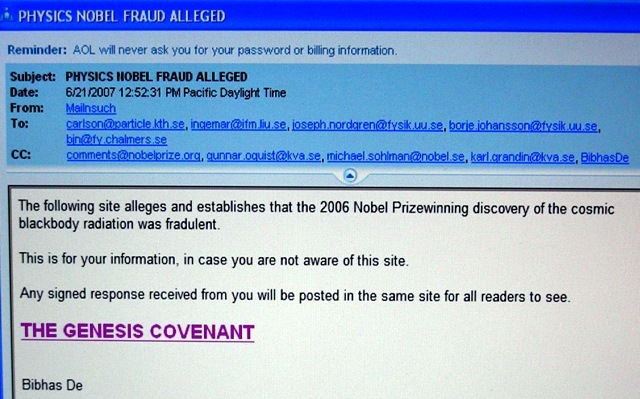 NOTE: The Press Release of the 2010 John Mather Nobel Scholarships Award is dated July 28, 2010. However, the first time it appeared as a public announcement (in the Henry Foundation website) was after August 6, 2010 – the date on which the internship at Goddard officially ended. (The website cached by Google on Aug 6, 2010 19:09:20 GMT, did not show the announcement.) So technically, the recipients were not NASA interns when the public announcement was made. See the ambiguity?! 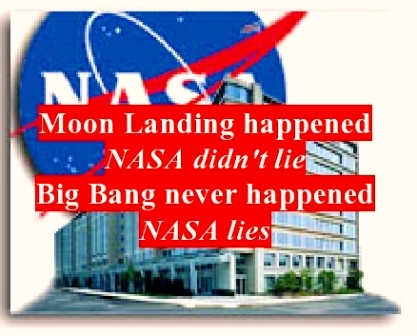 The Henry Foundation has no connection with NASA, and does not represent NASA in any way. The awardees were selected by a Committee of Directors, and former Directors, of NASA Space Grane College and Fellowships Program state Space Grant consortia. Catch an intern by the toe. India is giving NASA science fraud John Mather the highest possible visibility – bringing him to the venue where two of the top national leaders will be present. India has been feting Mather intensely for quite somtime now at mushrooming conferences with names like Pragyan, Technozion, Cognizance … and at such Government-funded institutes as IIT and NIT. As the rest of the World goes silent on Mather, India is going great guns celebrating him. Neki aur pooch pooch! It is a most interesting phenomenon. Currently, he is working as a senior astrophysicist in the Observational Cosmology Laboratory in NASA’s Goddard Space Flight Center in Maryland …. He was also listed as the 100 Most Influential People in the world by Time. How much sense does it take to stumble upon the incongruity of a “Most Influential Person in the world” working as a run-of-the-mill employee in one of NASA’s centers? Wouldn’t you instinctively ask: Why is he not at NASA HQ, providing vision and direction? Then wouldn’t you say to yourself: Something does not smell right here! If you then did the slightest amount of googling, you would find the source of the incongruity. Mather was in fact the all-important NASA Chief Scientist when he was named the Most Influential etc et al. He was since demoted drastically. Again, why? You would then quickly learn the reason! Every time I begin to sense that the World has woken up to the John Mather fraud, there comes a new announcement from India! A perfect illustration of the old German saying: Immer wenn über eine Lüge Gras gewachsen ist, kommt ein alter Esel und frisst es wieder herunter. In January, John Mather will be a featured guest on the same podium with Prime Minister Manmohan Singh of India. This will happen at the 97th Indian Science Congress opening on January 3 in the Kerala University at the latter’s Kariavattom campus. 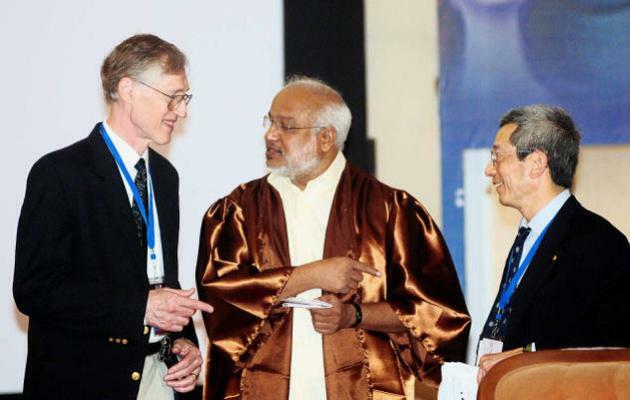 It is hosted jointly by the University and the Indian Space Research Organization (ISRO). Some 7000 scientists from India and abroad are expected to gather there. He wants science fraud John Mather to “inculcate” something or other in India’s young. Also, the Government of Kerala is sponsoring some 3500 students to attend and be inspired by the presence of eminent scientists like John Mather. The idea is to “to inculcate fresh ideas of science into young minds at an early age,” said Kerala Education Minister M. A. Baby. This part of the program will be inaugurated by the former President of India, A. P. J. Abdul Kalam. Not so long ago, wide-eyed young kids in India were subjected to the fraud John Mather’s homilies. The children reportedly listened “awestruck”. This is now happening again, on a far grander scale. What kind of people do this to the kids? God Almighty! Are these people completely loco, or are they just a few sandwiches short of a picnic? When a similar thing was being done to American kids, the Americans cracked down hard. They value their kids – above all else. There are some 200 countries in the World, and India is the only one exposing her kids to the fraud. In all fairness, Minister Baby is blameless. It is the scientists who have chosen science fraud Mather. “An American astrophysicist and cosmologist, Mather shared the Nobel Prize for Physics in 2006 with George Smoot for his work on the Cosmic Background Explorer (COBE) project. 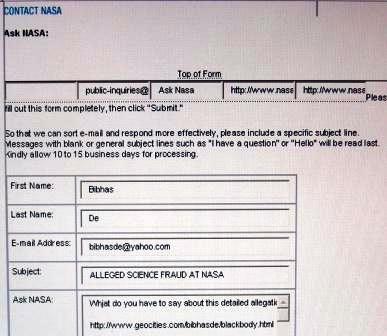 So may be Mather is participating as a private citizen, and not as a NASA Scientist. If that is the case, then neither NASA nor the US State Department can be blamed for subjecting the Indian Prime Minister to this public spectacle – to be recorded for posterity. The Indian scientific community is to be blamed for their lack of knowledge of current science, leading to subjecting a very fine man to this historical infamy. The scientific communities of all advanced nations have now gone silent on Mather. Yet, India continues to fete him with great fanfare again and again and again! Certainly, the people at the Indian space agency ISRO ought to have had the brainpower to understand the NASA space fraud the way high power space agencies like ESA and IKI have understood it and gone silent. What is wrong with ISRO? What makes a space agency world-class is not its ability to shoot rockets and put satellites in orbit. These are well-established technologies. It is the ability to function independently and self-confidently in the uncharted frontiers of space science and space technology that makes the difference. By feting an American space science fraud and his fraudulent discovery when America herself has gone cold on the subject, and the advanced space agencies of the World have gone silent, ISRO has made a strong statement about its own quality. By making the decision to present this fraud to their national leader, ISRO is making a strong statement about its own judgment. And to think that this 97th Science Congress wants to celebrate the quality of Indian science! Who are the Indian scientists planning to make this fine man and beloved leader shake hands with? Will the nation stand for this act of gross negligence and/or irresponsibility? Next up: The photograph of the Indian PM and John Mather shaking hands, hand-signed by John Mather, will be available for purchase online for $35 a pop (+ S&H) – like all the other Nobel paraphernalia Mather sells. If you put this picture together with that of the King of Sweden shaking hands with John Mather (see my previous post), you will have a matched set, a valuable collectible pair: Leaders of the free World proudly shaking hands with greatest science fraud in history. John Mather’s gigantic and diabolic science fraud – an enterprise protected by most powerful men and groups of men – was exposed by the highest scientific authority in the World (evidently!) – me. You can read about it, and also about what NASA’s top leadership did to him here. John Mather has a large display of photographs on Google Image Search that could be followed over time. As the allegation against Mather took hold, there arose a paucity of photographs of important people willingly posing with him. And the 2009 “John Mather Nobel Scholars” did not stand for the customary photograph with Mather (It may be that NASA shielded these young people – unlike the Indian PM’s folks who are not shielding him from the exact same predicament.) There cannot be found on the Internet a single photo of the new NASA Admninistrator Maj. Gen. Charles Bolden with NASA’s supreme scientist John Mather. There is no public indication that the two “leaders” of NASA even met officially. You should understand their response very clearly if no response comes. What is the big deal about the PM and John Mather being in the same conference? Simple. Would the PM attend an Economics conference starring Harshad Shantilal Mehta? In the instance of India, what the ISRO scientists are doing is neither light-hearted nor excusable. The Indian PM can and should take exemplary action against people who are engineering for him to be in the same venue with the greatest science fraud in history. This is a national embarrassment and a personal embarrassment for the PM. 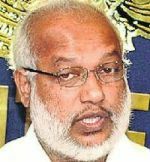 Let the public beware: The Indian Prime minister’s Office (PMO), the leader of ISRO, the organizers of the conference and the leaders of the Kerala University have been informed of the fraud through their official web mail or email. If they “did not know,” they now know! 3 January 2010: On this date some picture were released. Earlier, the attendance of two American Nobel Laureates, John Mather and Roger Tsien, was advertized widely. It seems that only one was selectively photographed with the PM. The set of pictures released shows a photo of the Indian Prime Minister greeting Tsien, and the Kerala State Education Minister greeting both Mather and Tsien. There is, however, a report that the PM personally and formally presented John Mather the General President Gold Medal. There is sure to be a photo of that event, but I have not found it yet. I will keep an eye out. 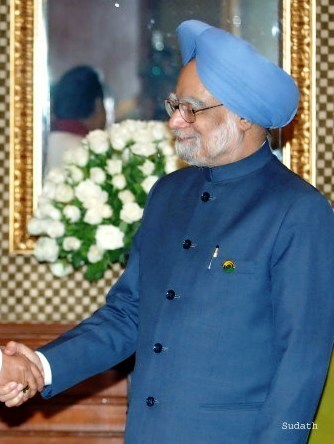 Indian Prime Minister Manmohan Singh greeting American Nobel Laureate Roger Y. Tsien. 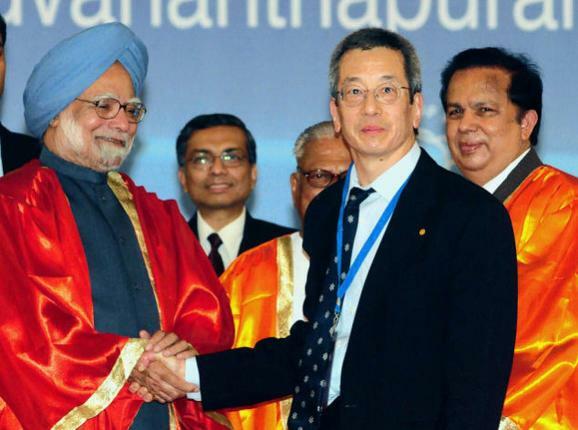 Tsien and science fraud John Mather received the General President Gold Medal from the Prime Minister at this function. History does not offer us one other example of a nation bestowing her high honor upon a known science fraud. Searching for the 2009 John Mather Nobel Scholars application form? In a matter of days, an acid test for NASA’s relentless whitewashing over the John Mather fraud will take place. Will this whitewash survive in the wash? 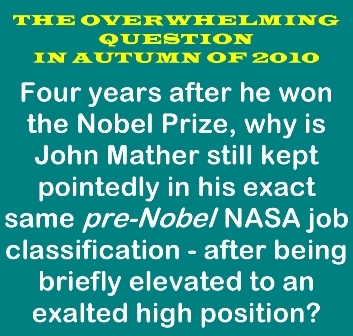 The “John Mather Nobel Scholars 20xx” program was set up last year, and the 2008 awards were announced on 16 July 2008. About this time this year, we therefore expect that the 2009 awards will be announced likewise in a Press Release. But will it? That is the acid test. Likewise, many sit on the committee to select the scholars. The program is administered at the NASA Goddard Space Flight Center, and the awardees are selected from among the summer interns. Forever scarred by NASA: The John Mather Nobel Scholars 2008. Will there be another crop in July 2009? I am figuring that I have put a stop to this unwholesome business of tarnishing America’s young in order to promote the Mather name. In addition, the Nobel name is still a good name. I am figuring that I have put a stop to this unholy effort by the above organizations to sully this name. 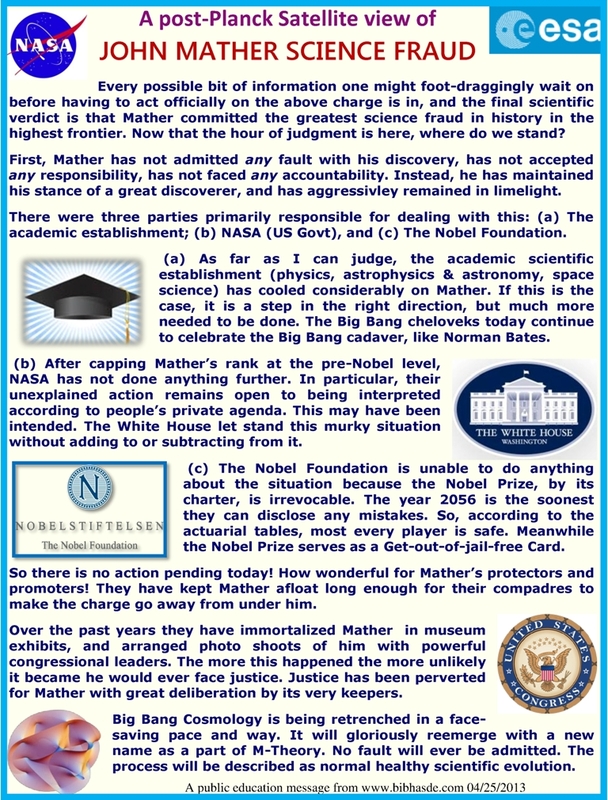 The above Award confers on you the designation “John Mather Nobel Scholar” (with all the rights and privileges pertaining thereto here and elsewhere…). How would you like to be labeled with that Appellation d’origine contrôlée? Look at the kids in the above photograph. They will have to omit from their cv the fact that they once were John Mather Nobel Scholars. He who lives by the Niger should not wash his hands in spittle. Er, der nahe den Niger lebt, sollte seine Hände im Speichel nicht waschen. Che vive dal Niger non dovrebbe lavarsi le sue mani in saliva. Il qui vit à côté du Niger ne devrait pas se laver les mains en salive. Он который живет Нигерией не должен помыть его руки в слюне. Él que vive al lado del Niger no debe lavarse las manos en saliva. There is now information indicating that the program is fully funded and the status is Go, and by all appearances it is an annual program (although this is not stated specifically.) So if this grandiose program is quietly withdrawn within a year after it started with such fanfare, you will know exactly what is going on. 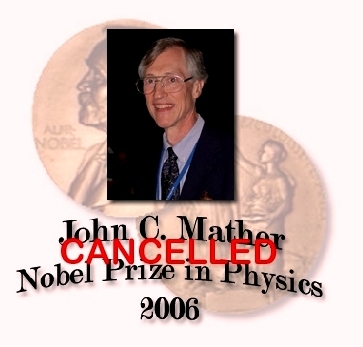 The non-award of the John Mather Nobel Scholars 2009 awards will be another clear proof of the subterranean acknowledgement of the John Mather science fraud. We will know in a matter of days now. Before you go west, think of your cv, young man! Would you like this scholarship on your cv? Kenneth and Linda Lay Scholarship – UNCF is an award that students win through a rigorous application process. Students who receive the Kenneth and Linda Lay Scholarship – UNCF do so for academic achievement and heavy involvement in their school or community. As a tribute to the Kenneth and Linda Lay Scholarship – UNCF, students are a representative of the full meaning of a noteworthy student. I don’t recall who my commencement speaker was when I graduated from the Universtiy of Houston, but Ken Lay’s signature is on my diploma because he was Chairman of the Board of Regents. I’ve had bad luck ever since. Maybe, I should try a voodoo ceremony and burn the diploma to change my life. An exorcism of it couldn’t hurt either. Fortunately, Dreamheron – who always gives the highest and the best advice when he chooses to give advice – remains unsullied himself. Whose signature is on Dreamheron’s last degree? His politics is debatable, but he was a solid, OK guy. 2009 Feb 19: We have received a significant contribution from the John and Jane Mather Foundation for Science and the Arts, toward student intern support at NASA’s Goddard Space Flight Center. 2009 NASA Academy at Goddard Space Flight Center. The Foundation is seeking individual and corporate sponsors for this activity. 2008 John Mather Nobel Scholars have been selected! While we are a public charitable foundation, we have our origins in NASA’s National Space Grant College and Fellowship Program. The reader can draw his/her own conclusions. The 2009 John MAther Nobel Scholarships have just been awarded to NASA interns! Not only has the program not stopped! It has been greatly expanded, and made international. Whereas five awards were made last year, twelve awards have been made this year, including two students from France. All in all, there are today seventeen bright young people who have been branded with the Mather name. At a cost of $3000 each. The selection for these awards given at NASA-GSFC was reportedly made by Directors and former Directors of a NASA organization, so there is no questioning that NASA is a willing party to this award. Also significant is the fact that this happens after the new NASA Administration is in place. Following last year’s example, the next Press Release should contain the photos of the new crop of Scholars along with John Mather, after they have been feted at a luncheon. I have said that this program would be a test. If it continues in 2009, it means that Mather gets away with it. It continues. AN UPDATE ON 21 AUGUST 2009: JOHN MATHER GAVE A PARTY AND NOBODY CAME? Want to add some letters after your name, young man, young lady? The time-honored Nobel name and the hallowed Mather name have become a part of your designation! And you get a check of $3000 to boot. And anyone can invest in John Mather collectibles. As they grow in value, you can proudly display them in your livingroom as framed art. All of the following are copyright and property of JG Autographs, Inc.
Photo of John Mather’s Nobel Medal, hand signed by him. Alfred Nobel photo hand signed by him (No, not by Alfred. By John.). Photo of an unidentified object, hand signed by him. Today, a copy of this book signed by Mather is listed at $300.00.